This article is written by Mr. B.Venkatadri. Out of years of my personal experience, I have come to learn that Rafi Saab is just not â€œChaudhvi Ka Chand Hoâ€ or â€œDin Dhal Jaaye Haaye Raat Na Jaayeâ€ or â€œAayi Hai Bahare Mite Zulmon Sitamâ€ or â€œYeh Chand Sa Roshan Chehraâ€ or â€œBadan Pe Sitare Lapete Huveâ€ or â€œAaja Tujh Ko Pukaare Mere Geet Reâ€ or â€œHaaye Tabassum Teraâ€ or for that matter, any of his well-known and popular songs running into hundreds! Rafi Saab, according to my estimate, has almost as many rare and lesser-known diamonds as his well-known and popular gems. I thought it may be a good idea to deal with some of these Rare Diamonds of Rafi Saab in this forum, taking two at a time, as audio songs. Each time, I wish to take up one sober/melancholy number and one lively and happy number! One word of caution, though. To a few people, some of the songs presented here may not be rare. But, if they are indeed rare and unknown (or even forgotten) to the majority, this series would have served its purpose! Today, I have in mind the following two songs. 1.â€Tere Kooche Me Armaanon Ki Duniya Leke Aaya Hoonâ€ from Film:Dillagi (1949), composed by Naushad Saab. Friends, we need to always remember a couple of uniquenesses in Rafi Saabâ€™s singing . Firstly, he is a master as far a throwing in Sangats is concerned. What exactly does this mean? For example, in many of his best songs, each Antara is repeated twice and Rafi Saab makes the two repetitions sound so different and makes both the repetitions amazingly pleasant by using Sangats, to slightly modify the tune each time. Mind you, Sangats are normally deployed by pundits only in highly classical concerts, etc. But, Rafi Saab had masterd the art of using Sangats effortlessly even in many lighter songs! Secondly, the feel and expression he pours into his songs by suitably modulating the voice is simply matchless. Sometimes, his voice gives out a tired and helpless tinge, as in this song under discussion. Some other times, it is a different feel and expression. That is why he is simply the darling of connoisseurs such as SPB, Jesudas, Manna Dey, Hariharan, Suresh Wadkar, etc. Just see the voice he deploys for this song. While his voice of the late forties and fifties is extremely fresh and by far his greatest, in this song, he makes it even better by adding that modulated feel to it. Of course, Naushad Saab had composed a divine tune, which was further enhanced by Rafi Saab. Also, observe how his second repetition of each Antara in this great song beats his own first enunciation of the same, which by itself is out-of-the-world! For example, the first time, he says â€œMila Tha Dil Se Jab Dil Yaad Kar O Bhoolne Waleâ€ in a plainer way. But in the repetition, observe the extra emphasis he gives on â€œMila Thhaâ€ and â€œDil Seâ€ and makes it so very attractive! All said and done, simply a divine rendition! 2. Friends, do you know this excellent duet by Rafi Saab and Shamshad Begum from Film: Musafirkhana(1955), composed by O.P.Nayyar? When OPN is mentioned, many remember/know only his â€œTum Sa Nahi Dekhaâ€, â€œNaya Daurâ€, â€œPhir Wohi Dil Laaya Hoonâ€, â€œKashmir Ki Kaliâ€ or â€œMere Sanamâ€, etc. This Musafirkahna (1955) has some very nice songs too, which are somewhat forgotten. Todayâ€™s song is â€œThhoda Sa Dil Lagaake Dekh, Nainon Se Muskuraake Dekhâ€ by Rafi Saab and Shamshad. The speciality of this Rafi-Shamshad duet is that almost the whole song is sung by Shamshad Begum and OPN uses Rafi Saabâ€™s voice only to sing the interlude music, by keeping the instrumentalists almost away! Just hear for yourself and enjoy Rafi Saabâ€™s â€œTararampum Pampam Pamâ€s all through this duet! The song is a lively and peppy one and was picturised on Johny Walker and Shammi. Lastly, shall be grateful for a candid feedback, which would help me assess the usefulness or otherwise of this proposed series. This entry was posted on Thursday, January 3rd, 2008 at 9:37 pm	and is filed under Audio Songs. You can follow any responses to this entry through the RSS 2.0 feed. You can leave a response, or trackback from your own site. rafi you have gone and leave us alone, but you are still among us and we are hearing you almost everyday and any time. you are the god of music and we are your bagth, we love you and missing you any time. I grew up listening to Mohd Rafi songs, although I was born after he became immortal. I think there is no replacement for Mr Rafi and his sweet voice. Thanks for posting these songs. Hope to hear more gems. Can any 1 pls send some good pictures of rafi saab. Mohhammad Rafi tu bahut yaad aaya. Iam Very Missed You Rafi Sahaab. U may pl send the photos directly to the web email id or to binus2000@hotmail.com founder of Rafi Foundtn or to A.S.Murty sir whose email id is mentioned in the comments blog. Mr Gurumurthy sahab, you can attach your cassette player to the computer and also download some software freely available which converts the input music into mp3 for e.g. a software called “audiograbber”. I will try to separately give the web address from where it can be downloaded. there are several others too but i have not used them. one has to have a lot of patience while converting music from cassette player to mp 3 format on the computer i.e. you will have to be alert with ‘pause’ and ‘play’ buttons and the record button on both the cassette player as also your media recording software. all the best. Refer post 19, Mr. Murthygaru, Apart from “Kal Raat Zindagi Se”, Palki had four more wonderful songs by Rafiji. The other solo “Cheharese Apne Aap To Parda Utayiye” was in two parts, one happy and the other sad. Rafi and Suman’s duet “Dile Betaab Ko” was another gem so also was the Rafi, Asha and Mannadey qawali “Bhari Mehafilme Cheda”. The title song “Palki Chali Gayi” was sung by Rafi and Mannadey. I have the songs of Palki in a cassette. Can any body suggest, how the same can be converted on to a CD? A.S.Murthy garu, I love the song from Palki, “Kal Raat Zindagi Se Mulaqat Ho Gayi” , but I do not have it and did not collect it, as I keep listening to it on Vividhbharati now nad then. My collection has only those songs that are heard rarely even on Vividhbharati. Dr. Aliuddin, “Main To Tere Hassen Kahayalon Me Kho Gaya” from Sangram is a great Rafi solo by the little known MDs:Lala Asar Sattar and of course, “Tera Husn Rahe” from Do Dil(MD:Hemant Kumar) is another gem, though not that rare. I will certainly discuss these three songs in some subsequent part of this series. Thank you very much for your efforts to bring the rare gems of Rafi Saheb. I will add two more rare and beautiful gems of Rafi Saheb to his fans. towards the evening today, i got a surprise call from mr ajit pachawar from kolkata and i came to know that mr ajit is the secretary of kolkata lovers circle and we had detailed talk. during this time, we came across chatting a beautiful song from ‘palki’ – kal raat zinadagi se mulakat ho gayi. this song too is a rare gem and a fine composition. unfortunately i do not have the song myself although i had wished to have the same for a long time. can anyone email it to me in mp3 format? my email is asmurty2@rediffmail.com thanks in advance rafians. Exactly..Venkat sir. It’s amazing that this man with an iconic status singing single-lines (Chalo dildar chalo…for instance), tarararam.s.., for little-known MDs and banners, little-known actors, old/beggar/street singer/comic characters..As u mentioned he considered singing as his Karma and believed in putting his heart and soul to every song offered to him. And he remained a play-back (or actors’) singer right till the very last, with his status he could very well have demanded that the actors adapt to his style (like many other established film singers did/do) rather than he adapting to them. Many thanks. That is why Rafi Saab was the darling almost all the MDs, about 250 of them! He used to do whatever the MD wanted him to do whole-heartedly, as his solemn duty. Whether it was just “Tararararararam”s or attempting humanly impossible voice scales, etc. Thanx Venkat sir for the two relatively lesser-known songs. I had listened to the “there koopche….” song before but not the duet. I found it difficult to believe it’s Rafi sahab himself with the “tharapampa..s”. He sounds so fresh, energetic and peppy..even peppier than in his Shammi Kapoor songs..
i wud like to add some more rare diamonds by naushadji & rafiji…. I sincerely empathise with you and appreciate your thorough and careful listening and appreciation of Rafi Saab’s masterpieces. Indeed, Rafi Saab needs to be heard so carefully and alertly. Rafi Saab also needs to be heard through one’s heart and not just from one’s ears! I fully agree with your views on “Caarvaaan Guzar Gaya Gulzar Dekhte Rahe” part of the Sapne Jhare song from Nayi Umar Ki Nayi Fasal. And also about the great emotion-stirrer of all times, “Yeh Mehlon Yeh Thakton”! Many thanks for your appreciation. I do have the great song that you mentioned. It is from Film:Mulzim(1963) and the MD is Ravi. I love the second line of the Mukhda. Hazir Hoon Koyi Teer-e-Nazar, Dillllll Pe Maaariyeeeeee! Though this song is not that rare, let us still try to discuss this song in another part of this series and then you can get to hear it. But, incidentally, the songs are actually uploaded here for playing and listening, only by the Admin. of this site, as per the writer’s text. He, I am sure, has all the songs that I have and many more! I may divulge here that I myself have collected most of these rare songs from the sister site of this mohdrafi.com, called Hamaraforums.com. In fact, the Admin. needs to be congratulated heartily by all Rafians for making this Mohdrafi. 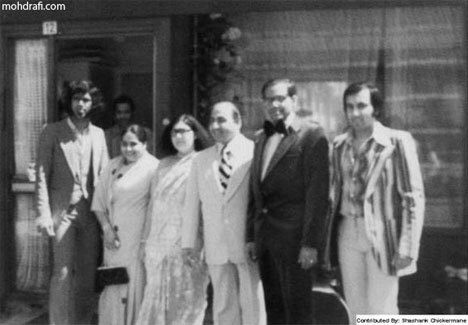 com and the Hamaraforums.com the ultimate authorities on this globe, on Mohammed Rafi Saab, his songs and career. 1)Caarvan guzar gaya gubbar dekhte rahe(Film Nayi Umar ki naye fasal-Music Roshan). Rafi saab had done full justice to each and every line that was penned by poet: Neeraj. The “typical” style with which he sings’caar..va..n’ makes the song so beautiful. In many songs you would have noticed how he sings the same word in two different ways-examples” tauba tauba” in the song Main nigahen tere chhehere se hataon kaise; ye jhuki jhuki “ni..ga..hen-there is a typical stress that Rafi saab uses in Ni..ga..hen in the song Main kahin kavi na ban jaon, tere pyaar mein … This is one of reason why Rafi saab’s songs become so beautiful. Sometimes even a mediocre song is taken to great heights by his inimitable style of singing. 2)Although not a rare song, I would definitely like to mention about Yeh mahlon, ye takhton, ye tajon ki duniya from Pyasa which is one of the best songs from Hindi film world. Rafi saab starts from a low scale and reaches the peak at …jala do phoonk dalo ye duniya. Also note the way he changes over from the intoxicated way he starts the first few lines and then changes over to a serious tone in ye daulat ke bhhoke riwazon kin duniya. Once he pleads ye duniya agar mil be jaaye to kya hai and then sings the same line with an anger. A real masterpiece!!! 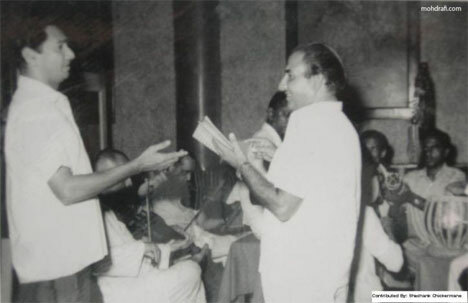 Dear Mr. B.Venkatadri, I very much appreciate your efforts to bring such gems of rafi sahib to his fans. Believe me rafi sahib is still live in our hearts because of such gems of him. No other singer could make such a hard grip on his fans like rafi sahib has made. Look at the lyric and imagine when rafi sahib sings it then what miracle is going to be created. Would you believe that I heard this song only once in my life may more than 40 years ago but I remember all the musical details which rafi sahib had rendered and enjoy in my imagination. I would appreciate if you could post this song over here. Many thanks for your posts. Hussain Sheikh Saab, I really appreciate your possession of such very old/very early/very rare songs of Rafi Saab. I will take your help at an appropriate time. In fact, out of all the hundreds of rare songs of Rafi Saab, I am taking up here some of the nicer ones, in my view. Thanks for songs. They are pure diamond! I love Rafi sahab, there’s no one like him. i would like to share with all my brothers this emotional outburst please. Exactly, Mr. A.S.Murthy. To try to know Rafi Saab completely and at the micro (grassroots level! ), it is important to listen to and know these rare diamonds thoroughly! Well, even then, Rafi Saab would remain unfathomable, as I once said earlier. THESE ARE ONLY FEW EXAMPLES, THERE ARE LOT OF RARE RAFI SONGS WHICH ARE VERY SOULFUL AND TOUCHIING OUR HEARTS. ALL RAFIANS ARE REQUESTED TO KEEP ALIVE THESE ALL RARE RAFI NUMBERS . I had heard the first solo earlier, but heard shamashad duet for the first time. The first solo is a blend of KL Saigal and Rafi himself. Nice songs and great effort by you, please keep it up. Nice article on rare gems of Rafi sahab. There are thousands of such rare gems, mostly known to all rafians and some forgotten by most rafians. also most have not been played on most fora like radio, stage shows, television, special programmes, etc. generally most music lovers think of songs like 1. yahoo (from junglee), 2. mere mehboob tujhe meri mohabbt ki kasam, 3. chaudavin ka chand ho, 4. hum bekhudi me tumko ko pukare chale gaye, 4. man tarpat hari darshan ko aaj or o duniya ke rakhwale or a hundred more of his most popular songs, when rafi sahab’s name comes up. but there are equal number of songs, some lost to most people and some totally forgotten or even unheard of rare songs that all classify under the term ‘gems’ if we are permitted to use the term. the two songs discussed in the article are of the ‘lost’ category, for many of us may not have heard them often or even if we had, we may have forgotten them. in fact, i had not heard the second song of rafi sahab with shamshad begum until i got to read this article. rafi sahab’s style of singing in the era of 1950s was different from his subsequent decades where he had matured much more and had established his uniqueness in such a commanding way that he has become immortal. the songs of late 1940s and upto 1950s were more predictable in their tunes and compositions, but the 1960s suddently threw up a plethora of strange but sweet compositions, the likes of which were not seen again after the 1970s. it is here that rafi sahab experimented on his own and presented the widest array of soft music, romantic tones and the boisterous and speed numbers. his songs on ‘love’ are incomparable to any other singer in as much as rafi sahab gave that extra meaning and that extra emphasis on the required words and lines. that benevolence did not exist with any other singer, earlier or after. many songs rendered in his unique fashion became instant hits and remain so till today. but many more of them, real ‘gems’ as i too would like to name them, did not catch the ears of the nation and either got lost or were forgotten. but by just listening to them even now in total silence, they throw of unknown qualities and perhaps even several images and messages, which hitherto had not quite caught our attention. i will just give two examples (while there are thousands) 1. zara sun haseena aye nazneen mera dil tujhi pe nisar hai and 2. sari khushiyan hain muhobbat ki zamane ke liye (suhana safar) (thanks to a true rafian who lent me these songs on my request very recently). i do not want to cut into this article or even the two songs mentioned therein, but am only trying to prolong the discussion on such rare pieces of royal music that the author mr venkatadri has rightly termed as ‘gems’. it is a good topic for discussion and will perhaps throw up many many songs from the memories of rafians when they too post their comments and to that extent itself the author would have succeeded. kudos.